Does your volunteer-support strategy combine service with learning? Does it intend to convert tutors and mentors into leaders and capacity builders. This video is a recording of a flash animation created by University of Michigan Grad student to explain this concept. You can also view the video on this Vialogues site, with updated comments. View this article to see the original version of this volunteer-growth strategy. Click here. To Find a Chicago Youth Organization where you can get involved, browse list of nearly 200 youth organization web sites at this link. 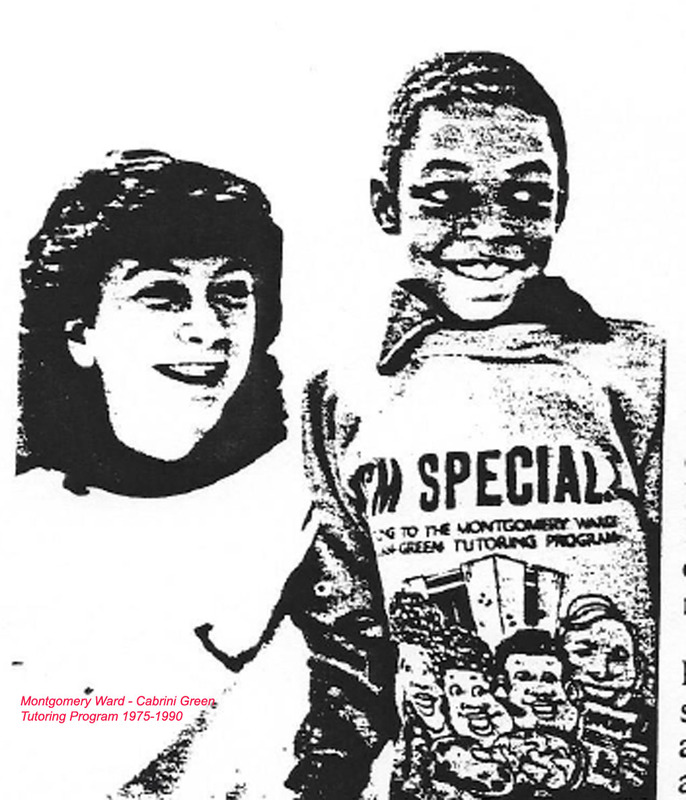 Since 1995 the Tutor/Mentor Connection has organized an annual volunteer recruitment campaign in Chicago to help all tutor/mentor programs attract volunteers. From 1995 to 2002 recruitment fairs were organized in different parts of the city and suburbs on one weekend in early September. Since then, the campaign has pointed potential volunteers, and donors, to a list of youth serving organization web sites, organized by sections of the city. As you become involved with any of these programs expand your knowledge and impact by using the ideas and resources shared on the Tutor/Mentor Institute, LLC web sites. Our aim is to help constantly improving k-12 tutor/mentor programs reach more youth, and help more move through school and into jobs and careers. Since 2011 the Tutor/Mentor Connection has been operating under the umbrella of the Tutor/Mentor Institute, LLC and has had limited resources to continue its calendar of events and maintain it's on-line support system. T/MI is looking for volunteers (and financial supporters) to help collect and maintain the technology and program information in the Program Locator Directory of Chicago tutoring/mentoring programs, and to help build and maintain web platforms that others can use to find different places throughout the Chicago region where they can help. Help is also needed to re-start and organize quarterly events, such as the November and May Tutor/Mentor Leadership and Networking Conferences to build public awareness and draw volunteers and donors to different programs in high poverty areas of the Chicago region. Visit the Groups section of the Tutor/Mentor Forum and join a group that interests you. On this web site and others, the Tutor/Mentor Institute, LLC and Tutor/Mentor Connection share many ideas that can be used by business, political, faith and philanthropic leaders on this web site, not just ideas that leaders and volunteers in tutor/mentor programs can use. We seek volunteers and partners to help communicate these ideas to larger numbers of people and to act as facilitators and consultants to help thousands of groups use this information to help high quality tutor/mentor programs grow in more places where they are needed. 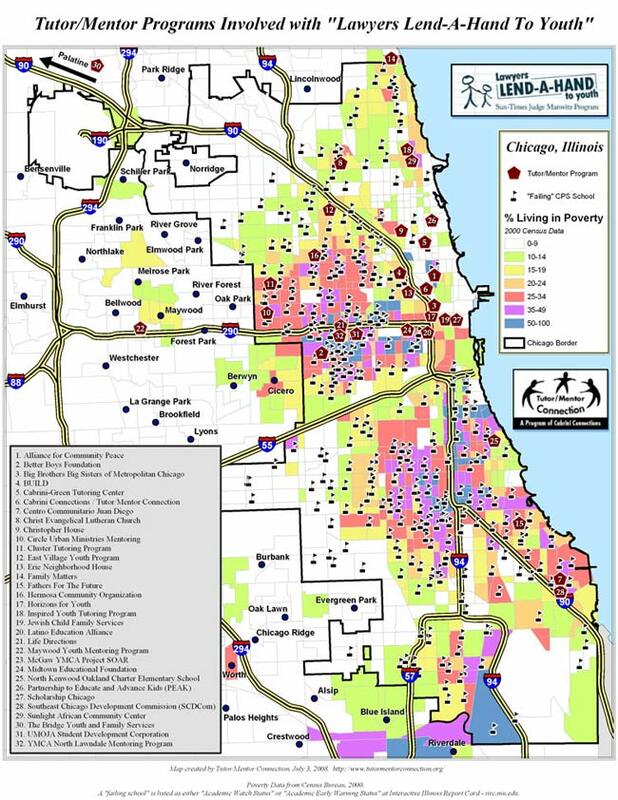 If you're not in Chicago, you can build a parallel T/MC-like strategy in your own community by helping re-build and update the T/MC strategy in Chicago. More attention. More volunteers! More donors! Tutor/Mentor Connection has been creating maps since 1994, such as those in the Map Gallery and the Chicago Tutor/Mentor Program Locator, to show where poverty and poorly performing schools are located in the Chicago area and where existing tutor/mentor programs operate, or where new programs are needed. While volunteer recruitment fairs were organized in different parts of Chicago between 1995 and 2002 to help programs recruit volunteers, most of the work Tutor/Mentor Connection has done since then has involved sharing information on the Internet and teaching volunteers and donors to use this information to locate programs in different neighborhoods. As more leaders draw attention to this resource, more volunteers will respond, and the volunteer recruitment campaign will draw more volunteers to tutor/mentor programs operating in different parts of the city and suburbs. Any city can duplicate this strategy, during the same August-September time frame. The campaign’s timing is linked to the start of each school year when all tutor/mentor programs in the region are looking for volunteers. The campaign officially kicks off in early August and runs through September. There is no more critical an issue in America today than the education of our kids. The gap between rich and poor is growing because of the huge differences in educational opportunities available to kids in the inner cities and those in more affluent areas.